Only son of George I. Born 1683. Created Prince of Wales 1714. Married the Princess Caroline of Anspach 1705. Ascended the throne 1727. Crowned at Westminster. The wisdom of Walpole's measures of finance had been made apparent in the last reign by a rapid upgrowth of commercial prosperity and a steady reduction of the nation's indebtedness. In brief, Walpole's ministerial policy throughout was a peace policy; to encourage industry and trade, and promote economy; and the result had been a notable increase in national wealth and prosperity. He was Prime Minister in 1727, when George II. came to the throne -hated, feared, and loved by him in turn. So much, indeed, did the King dislike his father's chief ministerial adviser that, if it were not for the Queen, Walpole would probably have been obliged to resign. But if King George II. feared that able statesman much, he feared his wife more. And as she had determined that no change should be made, Walpole remained in power. He remained in power so long that no Prime Minister of England has ever exceeded Sir Robert Walpole's continuous period of office, which extended to twenty years-fifteen in the service of George II. A lover of peace and liberty, a great statesman, good citizen, and patriot, who kept the nation out of war and brought it much-needed rest, enlarged freedom, and did his best to promote British commerce, as well at home as abroad. What wonder, then, that this "choleric little King" got to love that Minister whom he had first hated and later feared? It left him more leisure to "talk and to talk," old soldier as he was, about his earlier campaigns. "He is wild, but he fights like a man," said his father. At Oudenarde and Dettingen he had fought bravely. Nor was he in the least degree alarmed in the '45 by the arrival of the Pretender in his Kingdom. He quarrelled with his son Frederick, Prince of Wales, "as thoroughly worthless as it is possible for a mere fool to be," who died in 1751. For the rest, when Walpole went, there was war: war with Prussia, fighting in India, and with the French in Canada; and finally "the Seven Years' War" began (1756). "No war has had greater results on the history of the world, or brought greater triumphs to England; but few have had more disastrous beginnings." 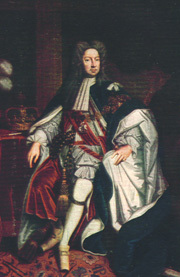 William Pitt, afterwards Lord Chatharn, was the statesman at the helm of affairs when that war began. It had not ended when George II. died at Kensington Palace.